Among the most important and intricate of all the works of Soren Kierkegaard, The Concept of Anxiety is deeply rooted in the life and personality of its author. First published in 1844 under the cryptic pseudonym Vigilius Haufniensis, The Concept of Anxiety is, according to its subtitle, A Simple Psychologically Orienting Deliberation on the Dogmatic Issue of Heriditary Sin. “Psychologically orienting” it may be; “simple” it is not. For Kierkegaard, burdened as he was with the guilt of his father, “heriditary sin” was not a theoretical abstraction but an existential reality. Yet the book, born of his daily struggle with anxiety, is perhaps Kierkegaard’s most difficult work, embodying the author’s great learning as well as his irony and his passion. Among the intellectuals of Copenhagen, The Concept of Anxiety passed almost unnoticed. But later generations of psychologists, theologians, and philosophers have come to recognize the work as a seminal contribution. 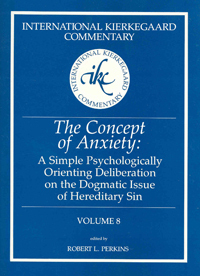 In this commentary eight recognized Kierkegaard scholars explore the sources and the continuing influence of the Concept of Anxiety. The Dane’s debt to Augustine, Kant, and Schelling, his debate with Hegel and the overarching system of Idealism, and his intellectual legacy to modern thinkers like Martin Heidegger are analyzed and evaluated. The relation of anxiety to freedom and knowledge, to time and eternity, to sin and the demonic is assessed with the care and sensitivity that Kierkegaard’s writing demands. In these essays the “Watchman of Copenhagen” may be heard in precincts far beyond his homeland.